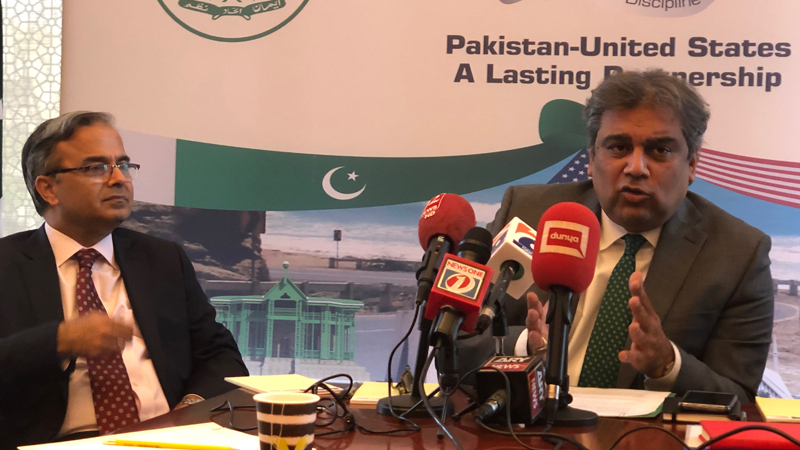 Addressing media on his first visit to Washington DC, Pakistan Federal Minister for Maritime Affair, Syed Ali Haider Zaidi, said that he hoped the global powers would understand the situation that they had pushed Pakistan towards. He called the war hysteria a part of Indian Prime Minister Narendra Modi’s election campaign. He hoped the global powers to realise that they had pushed a tremendous number of people into a corner who was now battling for their lives. Zaidi remained defiant to India, despite Pakistan’s recent indication to act against terror groups. Zaidi is on a three-day tour to the US to promote Pakistan’s economic potential. He first visited Houston where he met global business leaders to persuade US companies to invest in Pakistan. He met business leaders in the Energy Corridor, which is a business district in Greater Houston, Texas, and home to the world’s largest energy companies including BP America, Citgo Petroleum and ConocoPhillips. “Exon, Cargill is looking at Pakistan to set up shop,” he added. As US oil and natural gas companies explore untapped resources as a part of its renewed interest in offshore drilling, the minister expressed hope that these companies would also seek to invest in Pakistan. “Pakistan should be viewed as a very big global start-up,” he added while remarking that a country where 65 per cent of the population remained under 30 was a huge market for potential growth. Prime Minister Imran Khan was said to have gained the trust of the international community as an honest and credible leader. The maritime minister noted that credibility and transparency in a government were important because everyone wanted to do business with such an administration. “Pakistan is open to business for everyone. We are willing to do business with everyone. This is the concept for ‘Naya Pakistan,” he continued. Earlier in the day, Zaidi had met with US Maritime Administrator, Mark Buzby, with whome he claimed to have had a productive discussion regarding improvement in cooperation between the two maritime departments.